An MP has urged Facebook to tackle fake news in the run-up to the UK's general election on 8 June. 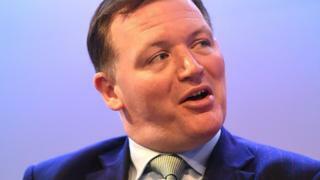 Conservative MP Damian Collins expressed his concerns to the Guardian newspaper, saying fake news threatened "the integrity of democracy". A parliamentary inquiry examining the "growing phenomenon of fake news" was launched by Mr Collins in January. Dealing with the problem was "a global priority" and an "evolving challenge", Facebook said. Mr Collins told the Guardian that the top 20 fake news stories were shared more than the top 20 true news stories during the three months leading up to the US election last year. "The danger is, if for many people the main source of news is Facebook and if the news they get on Facebook is mostly fake news, they could be voting based on lies," he said. He also claimed that Facebook did not respond quickly enough to the phenomenon, despite the fact that the social media site can detect when news stories go viral. Facebook said: "Improving news literacy is a global priority and false news runs counter to our mission to connect people with the stories that they find meaningful. "We understand that we need to do our part to help people understand how to make decisions about which sources to trust." The social network is examining various methods for this - including possibly adding labels to stories that have been reported as false by third parties or Facebook users, which would then warn others before sharing them. And this month it launched an educational tool designed to help people investigate the veracity of a story shared on Facebook. On 25 April, Google announced that it was altering the way its search engine works to try to curb the spread of fake news and hate speech. A recent study by economists at Stanford University suggested that while fake news had been viewed by many adults before the US election, there was little evidence to suggest that such stories had had a decisive impact on voting.